The one little twist I've added is that the song is in an alternate guitar tuning called dropped-D tuning. Don't let that scare you off, though, as this is one of the easiest alternate tunings to use and one that all guitarists should familiarize themselves with. Dropped D tuning is great for playing songs in the key of D, because it gives you that great low low looow D on the bottom string. When playing in the fingerpicking style, you can just alternate between the open sixth and fourth strings, which are both D but an octave apart. This creates a wonderful droning sound, while leaving all your fingers free to play the melody line. Here's how to play an open D chord in dropped D tuning. Notice you can use all the strings, giving the chord a really full sound. Use your index finger to form a bar across the three highest strings (the G, B, and high E strings) at the second fret. Then use your middle finger to play the second (B) string, third fret. This way of playing a D is slightly different from what most people learn, but it is important to use your index finger to form the bar because it frees up your pinky to reach down to the fifth fret on the first string, which we need to do for this song's melody line. See more ways to play a D on guitar in dropped D tuning, using the Chorderator. The open A7 chord is typically played the same in dropped D tuning as it is in standard tuning, since the low sixth string is not involved. See more ways to play an A7 on guitar in dropped D tuning, using the Chorderator. If you have a quick-change capo, you can achieve a similar effect to dropped-D tuning without actually turning any pegs. 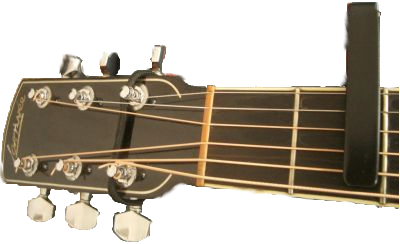 By placing the capo in such a way that it holds down the first five strings at the second fret but leaves the low E string open, you are in effect raising all except the low E string by a whole step. This will be the same as dropped-D tuning except everything will be a whole step higher. You can hear me playing this easy arrangement of Skip to my Lou, along with some simple variations. Don't be afraid to play around with the melody line and the rhythm.